Great review! Thanks for the review, when will you guys be reviewing the AMD Phenom II X6 for us mere mortals? I wonder how the Phenom II X6 will stack up against the Core i7 920/930. "Microprocessors take approximately five years to go from concept to product and there is no way Intel can add SSE5 to their Nehalem product and AMD can’t add SSE4 to their first-generation 45nm CPU “Shanghai” or their second-generation 45nm “Bulldozer” CPU even if they wanted to. AMD has stated that they will implement SSE4 following the introduction of SSE5 but declined to give a timeline for when this will happen." One of the best optimized and multi threaded applications out there is the open source video encoder x264. Would it be possible to test how well 2 x 8 and 2x12 amd configurations work at encoding 1080p video at some very high quality settings? I wonder if the difference between the Windows and Linux test results is related to the recentish changes in the scheduler? From what I understand the introduction of the CFS in 2.6.23 was supposed to be really good for large numbers of cores, and I'm given to understand that before that the Linux scheduler worked similarly to the recent Windows one. 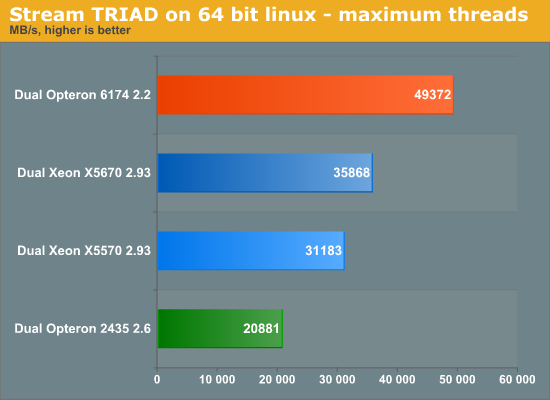 It would be interesting to try running that benchmark with a 2.6.22 kernel or one with the old O(1) patched in. demonstrated 92 percent scalability on either server type up to at least 10 servers. It could also be that Linux has a NUMA-aware scheduler, so it'd try to keep data stored in ram which is connected to the core that's running the thread which needs to access the data. I probably didn't explain that too well, but it'd cut down on memory latency because it would minimize going out over the HT links to fetch data. I doubt that Windows does this, given that Intel hasn't had NUMA systems for very long yet. Agreed. I do find it disappointing that they put so few benchmarks for Linux for servers, and so many for windows. I like the review and enjoyed reading it. I can't help but feel the benchmarks are less a comparison of CPU's and more a study on how well the apps can be threaded as well as the implementation of that threading -- higher clocked cpus will be better for serial code and more cores will win for apps that are well threaded. In scientific number crunching (the code I write ), more cores always wins (AMD). We do use Fluent too, so thanks for including those benchamarks! !